Mix together sour cream, cream cheese, vanilla, and sugar in a bowl. Mix together both types of grapes. Layer grapes in a serving bowl, then the sour cream mixture. Keep alternating these layers, but end with a sour cream layer on top. Top the dish with the brown sugar and pecans mixed together. 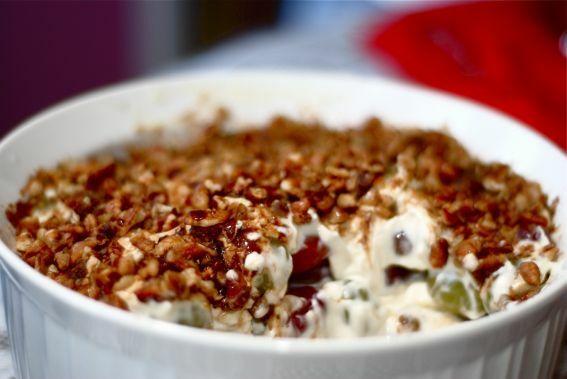 Just tried a Grape Salad yesterday with the first four ingredients( 4 lbs of seedless grapes (I use red, black and green) 8 oz of cream cheese and 8 oz of sour cream…1/2 cup sugar), but topped with 1 cup crushed Butterfinger candy bars mixed with 1 cup brown sugar! OMG! I could not not stop eating it. Going to store so I can make more! this is almost like the recipe I gave you that we make……………………………………………………………… 4 lbs of seedless grapes (I use red, black and green) 8 oz of cream cheese and 8 oz of sour cream…1/2 cup sugar and 8 oz of shredded cheddar cheese..never cut the grapes….mix the dressing in a large bown and stir in the grapes….put in a 9 x 12 loaf pan and top with 1 cup brown sugar and 1 cup chopped pecans. ( of course you stem, wash and dry the grapes ahead of doing this.) I use a hand mixer to mix the sour cream, sugar and cream cheese and then stir in the grated cheese. this is sooooo good… make it lots..we call it our lottie salad….. I make it lots too and always think of my little sister!!!!! Lottie, you brought this to one of the dinners, right? I think I will be making this! Mmmmm looks good, but “salad” lol I read the recipe, it’s dessert! IVE MADE THIS SALAD FOR SEVERAL YRS. ITS SO GOOD. ITS A BIG ONE SO YOU CAN CUT IN HALF..